Recently, Larry She, President of Danskammer LLC, invited the Southern Ulster Times for a tour of the inside of the cavernous power plant; a rehabilitation project that is still very much a work in progress. It was originally built in four phases, starting in 1951 and additional sections constructed in 1954, 1959 and 1967, respectively. She said after the flooding from Hurricane Sandy in October 2012 the two oldest sections of the plant took on 24 inches of water in their lower and basement areas. He said initially there was consideration given to scrapping the plant, however, the most expensive parts, the turbine generators and the control room, were not damaged by the storm. Plant Manager Ed Hall said as they inventoried the plant they were able to identify all of the parts that were damaged in the storm and needed to be fixed, such as electrical motors, valves and fittings. After a final price was established, they decided in May 2014 that the plant was worth saving and began to move forward. She said more than 70 people [40 full time and 30 contractors] have been working “feverishly” six days a week on the plant. He said this equates to “about 600 years of Danskammer specific experience to help bring this place back and to ultimately operate it.” Ray Hart has 13 years experience, Rich Backofen 23 years, Mike McGuiness 34 years, Robert Mason 9 years and Eric Holbeg at 33 years, to name a few of the crew. Rich Backofen’s own story mirrors what many workers feel about the plan to revitalize Danskammer. Presently 2 of the generators have been repaired and the remaining 2 will soon be finished, with the expectation that the plant will be operational by the end of this year. She described the fundamental way the plant works. “The sole purpose of the entire plant is to make clean water into very high pressure steam and that steam turns this engine that makes this generator make electricity; that’s basically it,” he said. “Everything in this plant is to make, control [and] monitor the generation of steam…The temperature and pressures are very high.” She said that if Danskammer’s 4 generating units were running at full capacity the plant could power a total of 450,000 homes. She pointed out that every power plant in New York is paid to be on standby. “You can think of it as a payment to be ready to make power at a moment’s notice,” he said. Danskammer receives $24 million annually from the state but She quickly adds there are “meaningful expenses” the plant incurs throughout the year, such as salaries and the recent expenditure of $11,000 just for panel light bulbs. During the rebuilding process She worked very closely with the Department of Environmental Conservation. “I characterized this as a one in ten thousand shot,” he said of their initial odds for success. He said many companies had “written this place off” and believed the plant would never again operate. “If more folks thought this place had a chance to return to service there would have been people clamoring at the opportunity to buy it; there were no takers,” he recalled. With Danskammer poised to return to service at a modest level of operation, it appears that once again power will be produced on the shores of the Hudson River in the Town of Newburgh. In the past few months it has become apparent there are sharp divisions among trustees of the Plattekill Library on where to locate a home for a new library and how to go about it. Most recently the board voted to stop consideration on a parcel, known as the Cider Mill property, that is just down from their present location on Route 32. The board has already spent $17,000 on structural and environmental studies on this parcel and sent the owner a deposit check of $9,250 in April 2014, which he cashed. In November 2014, the owner sent a check of his own back to the Library board’s attorney with all indications that the deal was off. Library Board President Lynn Ridgeway is on record stating that the library’s attorney decided on his own to place the seller's check in “escrow” and at this point, due to the passage of time, the check is no longer valid. Ridgeway also stated that no one on the Library Board instructed their attorney to take this action. The actual record, however, does not back Ridgeway's claims. A source who spoke on the condition of anonymity, pointed out that in a phone conversation the library board had with their attorney, he insisted that it was the board who instructed him to hold the check. The attorney did not mention a particular person but additional records reveal that Ridgeway is the sole individual on the board who has spoken with their attorney throughout the entire process. Recently, in a December 6, 2016 email, Ridgeway asked the library attorneys, Robert Scofield and John Allen of Whiteman, Osterman and Hanna, if they have any record of who decided the fate of the seller's returned deposit check. Ridgeway wrote "I was under the impression that the check was put in escrow. You made it clear to me last week that it was not. It was simply put into a paper file. Whose responsibility was it to notify the Board that the check was about to become stale dated in order for us to make a decision on what action to take, if any?" The response from both attorneys indicates that Ridgeway's questioning is at odds with the recollections of both attorneys. Schoffield wrote that he and Allen "are quite frustrated that there has been any insinuation that our firm did anything improper, with regard to the deposit check." Attorney Allen elaborated, pointing out that Ridgeway knew about the seller's returned deposit check in November 2014. He stated that during 2015 and 2016 his firm tried to "get the transaction to the closing table" and continued to negotiate the deal for the Cider Mill property, noting that the library board did not tell him to cease trying to make the sale happen. He stated to Ridgeway that she was the "conduit between me, as the attorney representing the board on the real estate transaction, and the board itself. I have never spoken directly to the other board members, so I am dismayed that members think that I misled the board or took any action with the purported deposit refund, other than the action which was discussed with you before being taken, and of which you were aware for the entire period since my November 17, 2014 letter." Allen's reference to a November 2014 letter was a response he sent to the seller's attorney after receiving a check for $9,250 from the seller with the implication that from his perspective the deal was terminated. In the letter Allen stated that the library was willing to buy the property "as is" along with a few remedial but not "mandated" conditions that were listed in the contract. He informed the seller's attorney, however, that "in the interim" he was holding onto the check that was sent to him. After the library board's recent decision to end consideration of the Cider Mill property, Allen sent a new letter to the seller's attorney requesting that the deposit money be returned since the November 2014 check was no longer legitimate. Allen pointed out to the library board that the Cider Mill owner may oppose returning the $9,250 and advised the board that if they were to file a lawsuit they could end up spending more trying to recover it. Since 2014 Ridgeway and board Vice President Valerie Smith have insisted to the rest of the board that the library has a contract for the Cider Mill property, despite the returned deposit and the owner failing to show up for two scheduled closings. Only after board member William Farrell pressed Ridgeway to provide proof of a contract did she seek an opinion from their attorney who stated in writing that a contract did not exist. Ridgeway chalked the entire matter up to a “misunderstanding,” however, the email record from Allen to Ridgeway clearly shows that while he tried to bring about a closing, he told her "we have never said in words or substance that the library is still under contract." Board member Farrell agreed with Egan's comments. In a series of emails, Ridgeway stated that she wanted to keep the appraisal issue confidential, with Farrell questioning the reason for the Library Board to keep it from the Town Board. "It gives us a starting point in regards to an actual price so we can discuss [it] with the town. Furthermore, since we used taxpayer money to pay for this, anyone can FOIL it [under the Freedom Of Information Law]." Ridgeway's one sentence reply was "They can FOIL it once they know it exists." In a direct response to Ridgeway, and copied to the entire library board and to the Mid Hudson Library Association, Farrell criticized Ridgeway's actions. "I would think that after your boondoggle of misleading the Library Board for two years, claiming we had a contract when we didn't and now the fiasco of who's responsible for not cashing the check from Nemeth [Cider Mill owner], which will cost the taxpayers $9,250, you would wake up to the fact that this [library] board is not some 'secret society' that is supposed to keep everything from the public." At their December 8 meeting, the library board unanimously approved $2,500 to pay for the town's attorney and consultants to review a possible sale of the present property to the library but voted not to share the actual appraisal of the library with the town by a vote of 3 yes, 2 no and 1 abstention. Bill Farrell, Joe Egan and David Padilla voted to share the appraisal while Ridgeway and Valerie Smith voted against the measure and Luz Ledesma abstained. Member Karen Adamson was absent. It did not pass because a majority of four votes was needed for approval, according to the NYS Education Law [sec. 266 (1)] which governs the Plattekill Library. Lynn Ridgeway did not return a call for comment for this article by deadline. Last week Edward J. Kelly, Executive Director of the Maritime Association of the Port of NY & NJ, addressed a large gathering of yacht club members from all along the Hudson River about a recent proposal that has been made by the U. S. Coast Guard to increase the number of anchorages for oil barges on the river. Presently there are two anchorage locations at Hyde Park and Yonkers and the proposal is calling for 10 new additional sites with 43 berths at the Yonkers Extension, Montrose Point, Tompkins Cove, Newburgh, Marlboro, Roseton, Milton, Big Rock Point, Port Ewen and Kingston Flats South. The proposal has generated significant bipartisan opposition from local, state and federal officials as well as from environmental organizations, citizen groups and residents from across the region. Kelly brought a different perspective to the conversation. He said the Maritime Association was founded in New York City in 1873 and is concerned with commercial navigation and shipping issues from the Long Island Sound, north to Albany and along the New Jersey shore. The association has about 550 paid corporate and individual members that consists of international shipping lines, marine terminals, tug and barge operators, admiralty attorneys, long shore laborers, marine underwriters, divers, fuel organizations and vessel staff facilities. The industry brings imports and exports to the greater Mid-Atlantic region, which is considered a gateway to the United States. “When you stop to think about the ramifications about how the world has gotten so small and the maritime industry transports so many of those goods in and out, it has really made the world a better place,” he said. 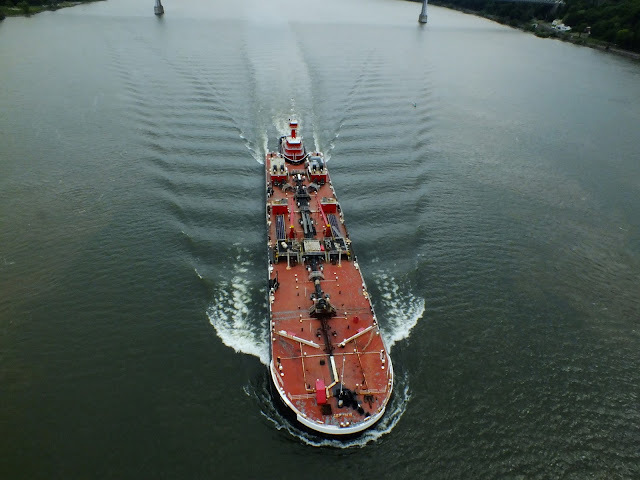 Kelly said the Hudson River Pilots Association and the American Waterway Operators are supporting his association’s internal tug and barge committee recommendations that have been submitted to the Coast Guard for the additional federally designated anchorage areas. Kelly said due to the high level of interest this proposal has generated, with more than 6,000 letters submitted, he expects a series of public hearings would be scheduled for the spring and a final decision by late 2017. Kelly said the reason his association favors the increase in anchorages is based on facts. Kelly said the safety record of water transport of oil products is well documented, with vessels now required to be double-hulled. "It is the cleanest and most environmentally friendly way to move freight. It is the most fuel-efficient [and] requires the minimal amount of infrastructure. It reduces roadway congestion and wear and tear, so therefore it reduces the need for public taxes to replace infrastructure, roads and bridges. It does reduce emissions both in the air and in the water as compared to any other mode of transportation," he said. Kelly estimated that one barge on a waterway saves 60 truck trailer trips on roadways. Kelly said the additional anchorages would help barge operators when facing difficult weather conditions such as fog, ice and sudden thunderstorms. The proposed locations have been chosen because they are in wide areas of the river, have deep water so ships would not run aground, provide shelter from strong currents out of navigable channels and are spaced in closer proximity so stopping points are not a far distance apart. Kelly said these anchorages would not be used by oil companies to park oil while waiting for their product to rise in value because the cost in equipment, man-hours and each with an attendant tugboat is simply cost prohibitive. He said critics who claim this is the real reason have "never looked into the actual economics or cost of trying to do that or else its an inconvenient fact they don't want to talk about." Kelly said the anchorages would be used for limited amounts of time, sometimes as little as 4 hours but typically to a maximum of 48 hours before the Coast Guard "says you must move." Kelly said the anchorage sites "do not require any construction or the placement of any infrastructure in or around the river. These are not proposed moorings and nothing will be placed on the bottom of the river…and no yellow lines painted on the water." Kelly said there has been speculation that additional barges would increase the chances of a terrorist attack, a correlation he discounts. He said the shipping industry is subject to U. S. Coast Guard approved vessel and facility security plans and all professional mariners are required to be U. S. citizens who must possess digital transportation worker identification credentials and have undergone extensive drug and criminal background checks. Crews must also have proper U. S. Coast Guard licenses, ratings and training certificates "for any type of operation they are engaged in, whether its the type of the vessel, the type of waterway or the type of products they are involved with." Kelly highlighted the importance of the shipping industry to the economy of the Hudson Valley region; by moving not only oil but commodities such as salt, sand, cement, crushed rock and oversized cargoes that cannot be moved on the roadways, to name a few. Kelly predicted that oil being brought through the Hudson Valley from the heartland and then refined for export would not happen because "it's too damn expensive" and selling it here make more economic sense." Kelly said extremely large vessels would not be able to travel up the Hudson. "You can't get big ships up here [and] we couldn't do that if we tried," he said. "If we put roller skates on the bottom of these ships we couldn't get them up here; there is just not enough water and that will never, ever happen." Kelly said having federally designated anchorage areas would prevent companies from placing cables in the river at will and if snagged when barge operators do not know where they are located could cause serious injury or death to a barge crew and cut off power to a sizable area. Having the anchorage areas be cable-free is a significant safety measure. Kelly concluded by saying "that's my story. We believe its based on facts…we realize that commercial operators are not the only people on the river [and] we also realize there are environmental and recreational concerns. There is a lot of mixed use of this wonderful river. Commercial activity is part of it and we want to find ways to work with other people in and on the river so that we can serve the needs of this community for the products they consume in as safe and economically and environmentally friendly manner as possible." Kelly was peppered with questions from yacht club members, which gave him the opportunity for further clarification. He reiterated his central point, saying he believed that additional anchorage areas would make the river's commercial activity "even safer, more secure [and] more efficient…we are looking to mitigate risk. It has been proven over time that designating areas, marking them on proper [maritime] charts has been the safest solution." Kelly said the mid Hudson region is being considered for the additional anchorages because it is between the ports of New York City and Albany but they will be "fairly evenly spaced." Marlborough resident John Scott disagreed, pointing out that 16 anchorages are proposed for a 32-mile stretch of the river in this area. Kelly was asked if the industry would agree to limit the number of barges on the river at any given time if the additional anchorages were granted; Kelly responded with a question. "Is there any place in the United States where you are going to tell people what they can do? That's against the Constitution. We would never get that enacted,” he said.